Manage your calendars, contacts, tasks, and notes. 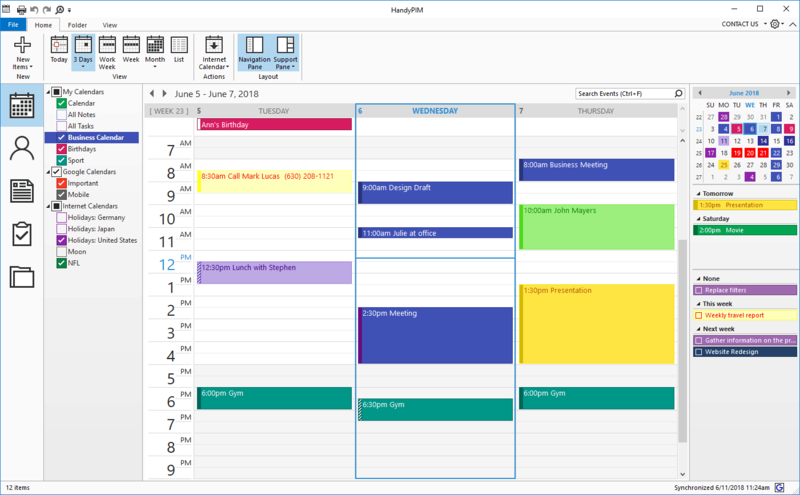 HandyPIM has everything you need to organize your life. Display your schedule in Day, Work Week, Week, Month, or List views. 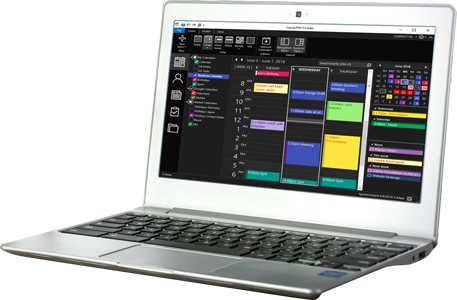 Create any number of calendars to keep track of different types of events. Create multiple contact lists, and use different customizable views to display them. Keep track of important things you need to get done. Create single or recurring tasks — or plan tasks that have no due date at all. Organize contacts, events, notes, and tasks in ways that make sense to you. Write down your thoughts, add photos, pictures, and tables. Use colors and text formatting. Pin notes to a date to display them in your calendar view. Never miss an appointment or deadline again. Print any information using a range of customizable print styles and layouts. Set up a schedule to back up your data automatically. 256-bit AES Encryption. Use a password to protect your data from unauthorized access. Find any item you need first time, every time. Synchronize calendars, contacts, and tasks with your Google account. Switch between a light or a dark theme whenever you like. Select the components that you would like to display. Attach related files to any item. Use different fonts, font sizes, and colors. Add text formatting, pictures, and tables to your notes. Import items from external sources, including Outlook, iCalendar, vCard, CSV, and text files. Export your data to use in other programs. Subscribe to Internet calendars to gain instant access to weather, moon phases, holidays, and sports and cultural events in your neighborhood — or anywhere in the world. For personal, non-commercial, and non-profit use only. Install on up to five compatible computers in your household for use by people who reside there. Includes a 12-month maintenance plan giving you access to free updates (both major and minor) and priority technical support. For commercial purposes and general use or/and in business environment. Copyright © 2018-2019 Duality Software. All rights reserved.